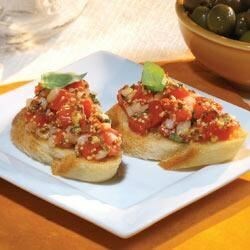 "Classic tomato and basil bruschetta get a zesty update with old style mustard." Toast the bread in the oven. Rub the bread with the garlic and top with a drizzle of olive oil. In a bowl, stir tomatoes, onion and Maille(R) Old Style mustard. Spread preparation on the slices of toasted bread. Add olive oil, salt and pepper, and garnish with chopped basil. delicious, love old style mustard, will make again!